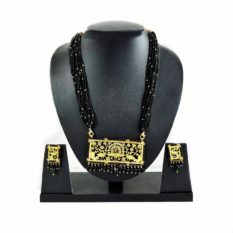 Presenting a beautiful traditional gold necklace designs from Thewa Art work, which matches up your lovely outfit on any ceremony and occasions. 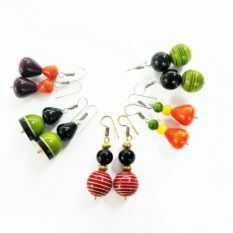 This jewellery is a set of a beautiful neckpiece and a pair of earrings. The Red beaded neckpiece, enriched with a flower pendant & earstuds make this set look unique and extraordinary. Uniqueness : Fusing of hand carved 22 karat gold into the glass surface without using any Glue or pasting material is a Secret art known only to artisans of Raj Soni Clan. Shri Mahesh Soni, Chief Artisan, GI Panchayat Pratapgarh. & Branding Jewelry Box & Courier Bag.